Even though the Republican Party controls the House, the Senate, and the White House, GOP leadership has struggled to find enough consensus among their members to pass the omnibus. Instead, the government is limping along with a series of short-term CRs while avoiding hard decisions on longer term funding priorities. This constant negotiation on funding between the White House and Congressional leaders from both parties means that there is less time to negotiate other issues, like necessary reforms on Section 702 NSA spying program, which is scheduled to sunset at the end of this month. Faced with multiple looming deadlines, legislators may be tempted to include Section 702 reauthorization in one of the funding bills. The allure of killing two (or more) birds with one stone often becomes overwhelming this time of year. Instead of taking the time to negotiate and navigate multiple difficult votes on various contentious bills, leadership finds it easier to find a majority only once. Who will decide to include 702 reauthorization language in the CR? After consulting with the various Chairmen of Committees of jurisdiction (in this case, the Intelligence and Judiciary Committees), Congressional leadership, along with the White House, will decide what will help them get the votes they need. For example, a member who is not inclined to support a spending bill on its own may decide to vote “yes” on a spending bill that includes language to prohibit the NSA’s controversial “about” searching. Of course, the reverse can also be true, which is why such discussions will happen behind closed doors. Yes and no. Individual members or groups of members (often called Caucuses) would have to tell their leadership that they would not vote for any spending package that contains language they don’t like. If the numbers work in their favor, and leadership believes them, this will keep the language out of the bill. However, leadership may choose to call the members’ bluff. If the language is added over members’ objections, the members can still vote no on the whole bill. But that could cause the bill to fail and shut down the government. Government shutdowns are highly disruptive to many people, and thus politically risky. The members and the leadership take that into consideration. It’s a high-risk game of chicken—with very real and long-term consequences. Can the language be amended once it is added? Practically speaking, no. All the language in the CR is carefully negotiated behind closed doors, so leadership does not usually allow any amendments in case something accidentally passes that would cost them votes. Is there any limit to what language can be included in a CR? Once again, practically speaking, no. In theory, no spending bill – CR or omnibus – should contain language that isn’t related to funding the government. Of course, how we fund the government often has policy implications, which is why these bills are often so contentious and so tightly negotiated. For example, earlier this year Rep. Kevin Yoder (R-KS) sponsored language in a funding bill that would prevent law enforcement from using any taxpayer dollars to seize cloud-hosted documents (email, photos, etc) without a warrant. In practice, the policy impact of this language would have been quite similar to the Email Privacy Commutations Act, but Rep. Yoder’s language actually only prohibits funding these actions. Adding language that has nothing to do with government funding at all, like reauthorization of the Section 702 program, does happen, but it is rare. A CR is even less appropriate than an omnibus as a vehicle to make new policy. As it is designed only to be a temporary, short-term measure, a CR is theoretically only a continuation of current funding levels, with no major funding changes and no major policy changes. In practice, this rule gets waived (at the discretion of the leadership), especially when pushed up against a deadline and when the added language brings in needed votes. How will we know if or what 702 reauthorization language has been added to the CR? In normal circumstances, all legislation is supposed to be public for at least a day before Congress votes on it. Unfortunately, these are not normal circumstances. When there is a difficult, tightly negotiated bill and a looming deadline (like with both the CR and Section 702 reauthorization), the House of Representatives may enact something called “martial law,” allowing leadership to move quickly through debate and final passage as soon as they have an agreement - before the media or the public have an opportunity to comment. EFF is in constant communication with members interested in reforming Section 702, and we’re fighting alongside them to make sure Section 702 reauthorization does not sneak through in the dead of night. We’ll make sure to let you know when we know! No! While the legislative calendar may pose a challenge, it is completely unacceptable for Congressional leadership to shove Section 702 reauthorization into an end-of-year funding bill. This program invades the privacy of an untold number of Americans. 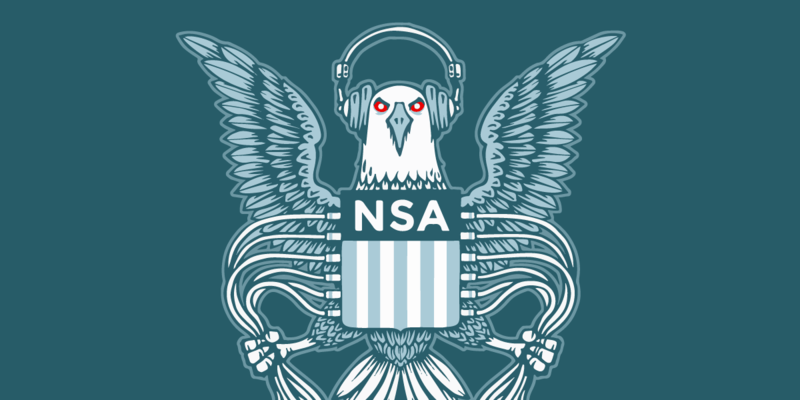 Before it can be reauthorized, Congress must undertake a transparent and deliberative process to consider the impact this NSA surveillance has on Americans’ privacy. It is troubling that a secretive NSA surveillance program may be reauthorized in a secret legislative backroom deal. But this program is too important to be hidden in a big funding bill, and members shouldn’t be forced to choose between shutting down the federal government or violating the Fourth Amendment.